Based on the ebb and flow of oral argument in Biestek v. Berryhill, we predict a formalist-pragmatist division between the justices, rather than one based upon the usual liberal-conservative fault lines. Biestek was a relatively unheralded and unremarkable case about administrative procedure and the denial of disability benefits. The hearing generated very little press coverage and may have even seemed a little dull to spectators without a keen interest in the outcome or in administrative law. However, for this very reason, Biestek may end up being emblematic of the 2018 Term, a Term in which the Court appears to be trying to stay out of the limelight and avoid the impression that every case is a pre-determined political contest. The results of our predictive model based on the oral argument transcript are shown in the figure below. The model captures the formalist-pragmatist division as reflected on the opposing views of conservative Justice Gorsuch and equally conservative Justice Alito. However, the model does not capture every nuance of the argument. Some additional background helps explain the issues. Biestek applied to the Social Security Administration for Supplemental Social Security Income and benefits in 2010. In a hearing to review the denial of his claim, a vocational expert testified that there were jobs available to Biestek in spite of his disability. The vocational expert based her testimony on private data that she refused to produce. Nonetheless, based on this secret evidence, the Administrative Law Judge (“ALJ”) found there was work available to Biestek and denied his claim. The Sixth Circuit affirmed on the basis that the strict requirements of the Federal Rules of Evidence do not apply to Social Security disability proceedings. Petitioner acknowledges that the Federal Rules do not apply, but contends that the ALJ’s decision failed the substantial evidence threshold. Thus, the essential question in the case is whether a man should be denied disability benefits when the expert evidence against him is based solely on data that the expert declines to reveal. If we were in federal district court [and] if on the key issue in the case the evidence depended upon the testimony of an expert, and the expert said, ah, I’m not going to give you my underlying data, it’s secret, I don’t think we would hesitate to find that no rational jury could sustain a verdict in favor of the party propounding that expert. Why isn’t the same true here? Each year, there are about 2.6 million initial disability claims that are filed with SSA, and at the third level of review, the SSA conducts 670,000 hearings. That’s about 200 — 2500 a day. Over 1 million people are waiting for just a response for their hearing, and they wait, on average, about 605 days. There is no adjudicatory process on a scale comparable to this. The Chief Justice and Justice Alito did not seem convinced that the secret basis of the vocational expert’s opinion was any great problem. Justice Breyer, on the other hand, had clear reservations about the reliability of the testimony of vocational experts but thought that this issue would be better addressed by a test case of some kind. The case is hard to predict. Justices Gorsuch, Ginsburg, and Sotomayor seemed clearly inclined to the view that secret evidence was no basis for an administrative decision. However, Justice Kagan raised telling objections on both sides of the argument and Justice Kavanaugh’s limited comments to the Respondent did not contribute much. In Timbs v. Indiana, the Court saw a particularly lopsided oral argument in favor of Petitioner, who argued that the Eighth Amendment’s excessive fines clause is incorporated against the states under the Due Process Clause of the Fourteenth Amendment (or alternatively, the Privileges and Immunities Clause). There are many reasons why Petitioner Tyson Timbs is a sympathetic litigant, and why his constitutional argument is persuasive. He is the prototypical victim of the opioid epidemic: having become addicted to hydrocodone for foot pain, he took to dealing small amounts of heroin to fund his habit. He used his one considerable asset, a $42,000 SUV bought with money inherited from his father’s $73,000 estate, to drive to the sites of two deals of value $225 and $160. Timbs was convicted and put under house arrest, and subject to fines totaling $1,200. But the state of Indiana seized his $42,000 SUV as an instrumentality of the crime, subject to in rem forfeiture. According to Indiana, there is no meaningful limit to stop police directly profiting from seizing cars used in drug crimes, or even cars going 3 miles over the speed limit. According to Timbs, the constitutional guarantee against excessive fines should be incorporated against the states because freedom from excessive fines is “fundamental to our scheme of ordered liberty.” This constitutional protection is vital with respect to fines because, unlike other forms of punishment, fines are particularly prone to abuse as a potential profit center for the state. Furthermore, as Timbs’ brief argues persuasively, such forfeitures have been used for centuries to oppress the poor, perpetuate Jim Crow long after the Civil War, and give problematic police departments, such as that in Ferguson, Missouri, a mechanism of harassing racial minorities. Yet, as is so often the case in criminal procedure cases, few of these compelling arguments appeared to shape the justices’ inquiries in the case. Only Justice Sotomayor made passing reference to these pressing social concerns. The real point of interest in the oral argument was how justices from various points on the ideological spectrum seemed to be converging on a decision in favor of Petitioner while maintaining starkly different motivations and reasoning. It was particularly fascinating to see that the differences among the conservative justices and among the liberal justices were more sharply drawn than the distance between the conservative and liberal camps. Among the conservatives, Justice Gorsuch and Justice Kavanaugh seemed to be competing as to who would come out swinging most against the state. Kavanaugh repeatedly asked a version of the question “aren’t all –all the Bill of Rights at this point . . . incorporated?” Gorsuch clearly won, however, immediately jumping into a 138 word monologue, demanding that Respondent advocate “at least agree” that the Excessive Fines Clause is incorporated against the states, and subsequently goading the advocate, asking if he “really wants” the Court to address a secondary question. In contrast, Chief Justice Roberts and Justice Alito pushed hard against Petitioner’s argument, questioning whether any fine can be excessive in comparison to prison time. The figure below reflects this division, with Roberts and Alito favoring Respondent. However, there is reason to think that they may not vote that way: for institutional reasons, the Chief is unlikely to want to be on the losing side of a case recognizing a constitutional right. Also, by the end of the argument even Alito seemed troubled by the implication of Respondent’s position that individuals pursuing Second Amendment rights would have to establish each aspect of the right both at the federal and state level. There was also division among the liberal justices, but over the reasons for and extent of support for Petitioner. As mentioned, Sotomayor did consider the practical reality of civil and criminal forfeiture; Justice Kagan, in contrast, repeatedly raised a question of great interest only to constitutional scholars: at what level of generality should a constitutional right be recognized? Justice Breyer raised strong institutional concerns with Petitioner’s position, particularly regarding the role of stare decisis and the logical conundrum of protecting against excessive fines given the lack of a meaningful proportionality requirement in sentencing. In contrast, Justice Ginsburg so clearly came to the aid of Petitioner’s advocate, Wesley Hottot, that he subsequently committed the faux pas of referring to her as having “assisted” him earlier. Based solely on the oral argument, one might think Breyer was a vote for Respondent, but although he was clearly weighing some broader institutional issues, our reading of Breyer’s constitutional theory leads us to the opposite conclusion. Breyer’s congenial verbosity makes him harder to predict than many of the other justices. Thus, while the numbers show a 5:3 split in favor of Petitioner, we expect that the case will be much more lopsided, perhaps even unanimous, since even ultra-conservative, ever-silent Justice Thomas called for the Court to hear the issue. Very lopsided and especially unanimous cases are harder to predict on the numbers from oral argument: even if the justices all expect to vote in favor of one side, we would still expect them to talk during that advocate’s time, since modern norms of Supreme Court oral argument involve a lot of justice speech. This makes the numbers less reliable in lopsided cases, showing the importance of both qualitative and quantitative analysis. We do, however think that the figure reflects a real division between the justices, particularly between the Chief and Alito versus the rest of the Court. This division just may not be reflected in the final votes. We expect that either Roberts and/or Alito will vote for Petitioner on the question presented but write a narrowing concurrence. 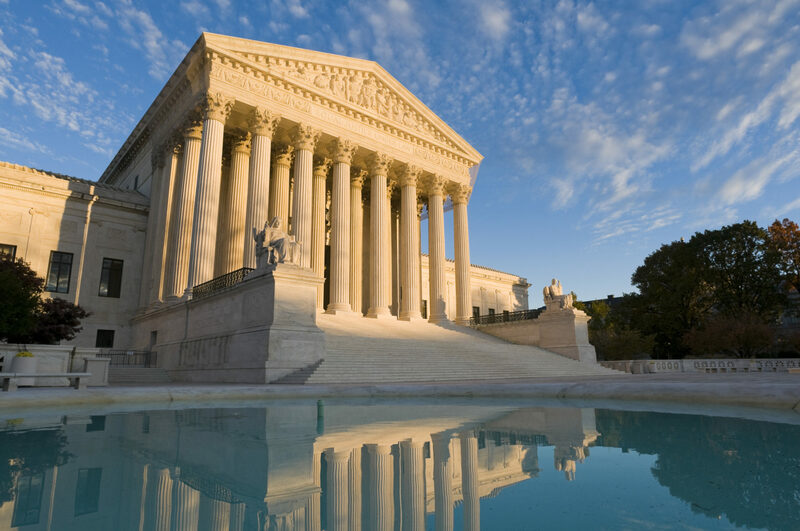 In our previous two posts (this one and this one), we examined the implications of justices cross-referencing other justices at oral argument. In this post, we take the analysis a step further and focus on the content of those cross-references. Word clouds are the text mining equivalent of a Rorschach test. The frequency of each individual word in a “bag of words” is of course an objective fact; but the significance each viewer gives to that fact depends on his or her expectations. Our interpretation of the word cloud above is that when justices are referring back to other justices in the modern era, they are overwhelmingly attempting to go back to a specific question raised by that justice. “Question” is the dominant token in this word cloud, occurring more than twice as often as the next two tokens, “answer” and “think.” Likewise, “answer” suggests a reference is being made to an earlier question; “think” is more generic. Previously, we have shown that the modern era of oral argument is defined more by comments than by questions; we have also shown that questions are more often asked of one’s friends, and comments are put to one’s foes. Finally, we have shown that judicial cross-references are generally made between two justices who ultimately agree with one another in the case at hand. As such, it follows logically that justices’ cross-references tend to focus substantially on fellow justices’ questions. This content analysis further buttresses this prior evidence of the relationship between questions and agreement, comments and disagreement, and judicial cross-references and agreement.